gardansolyn Published on Jan 7, 2019 The ORX metal detector from XP is an easy to use machine which can locate targets at impressive depths. Deep coins and artefacts can not hide from this machine as this video demonstrates. The MI-6 pinpointer compliments the ORX very well it saves a lot of time when location deep targets. gardansolyn Published on Jan 28, 2019 XP ORX top tips - How to get the very best out of your metal detector. This video shows some top tips which may help to enhance depth and find those deep coins. 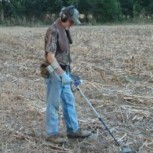 Follow Gary in the field digging some live targets and see how this metal detector performs. Gary is really great explaining about the ORX in his videos. He has a easy layed back way of getting over to you what he wants you to know about the ORX. The ORX is looking good to me. A simple version of the Deus but still seems to pack a punch. I have swung a friends Deus and the weight is ridiculous and I love the “back phones”. The cost always kept me from taking the plunge but I may have to give one of these a go. My brother and I have just each ordered one. With my tennis elbow I am really looking forward to a super lightweight detector. I can't wait to try out the 9" coil at the farm (large amounts of iron). I think it will be a great companion detector to the Equinox 800 that I have. I would give my eyeteeth for a 9" coil for the Nox. I don’t think the Orx is gong to have much impact in the gold prospecting world but it looks like it’s going to be a popular option for general purpose detecting. I basically like what I see. It’s funny how it’s tempting to jump on a new model when I don’t actually need one. A new video just was posted on the net yesterday showing the ORX being used for nugget hunting in Australia. What they were showing I’d say it was doing great. Seeing is believing but sometimes do you believe what you see . I sold my AT pro (too heavy) and my F70 (didn't push enough volume for my poor hearing) and got the ORX as my "backup" detector. Even at 2.9 lbs I still have to use a swingy thing to support the Nox if I am going to swing it all day. I have always wanted an XP but couldn't bring myself to spend the money for a new Deus and I didn't want to buy one that was used and possibly get one with issues. It’s bad at 39 and holding but it’s pure hell when you’re pushing 78. LOL - I keep working my way to lighter and louder detectors. I need to figure out a way to pair my hearing aids to the detectors. I told my son that one day I will be limited to watching him detect.
. I basically like what I see. It’s funny how it’s tempting to jump on a new model when I don’t actually need one. Thats kind of where I’m at. Probably will scoop one up when the IRS return hits the bank! XP are always working on ways to improve our products, we are pleased to announce the new revised coil charging clip offering an advanced durable Polymer and upgraded charging pins.